A place to be free. But it’s no paradise. Freedom is a hard thing. Hard choices. Decisions. Problems that have to be worked out. No one to make you work. Too much to do. Not enough to do. Interest. Boredom. Distractions. High hopes. Joy. New discovery. Chaos. Frustration. Encounter. Where hell and heaven meet head on. A place to feel human. A place to love. A place to hate. A starving, striving community. Good classes. Thought flows. Shakespeare. Logic. Religion. Integration of people and ideas. Math. Psychology. Rainy weather. Rainy people. Water fights. Sunny weather. Sunny people. Good conversation. Thomas Merton. Philosophy. Where the real is real. The phony obvious. James Baldwin. Art. Social problems. Jewelry making. Politics. Love and marriage. William James. American studies. Seeing connections. Ecology. Real work. Paul Goodman. Welding. A vision and a reality: Which is which? French. Confronting oneself and others. Crises. Learning from failure. A place to look at any idea or issue. Trips. The Hopi. Mexico. Writing. German. Community and privacy: How to balance? Inspiration. A good book. Disillusion. Carl Rogers. Bare feet and jeans. Not enough money. Peace and quiet. A hike on a spring day. Spanish. Bird listening. Bird watching. Social concerns. Standing for one’s own beliefs. Drama. Poetry. Conflict. Singing. Music. Need for order. 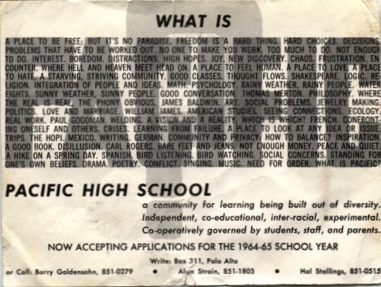 What is Pacific? A community for learning built out of diversity. Co-operatively governed by students, staff, and parents.